Bali is the most popular destination in Indonesia but Java, on the other hand, is an untamed beauty and there aren’t many foreign tourists in the region. 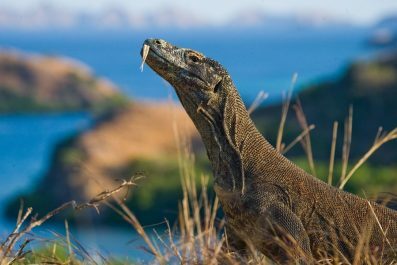 Aside from surfing, Java boasts diverse attractions – rain forests and caves, beaches and islands, mountains and volcanoes, temples and museums, national parks. Wonderful surprises abound here but Java is so vast that in 1 week, you will only be able to explore a small part of it. However, with careful planning and prioritizing, you will be able to maximize your time and see some of the major attractions. This 7-day itinerary is for those who are short on time, but still want to get a good taste of what Java has to offer in one week. Language – Bahasa Indonesia is the national and official language of Indonesia. English is taught in schools and is widely used in Indonesian cities like Jakarta, so do not worry about not knowing local phrases or words. It is, however, recommended to learn some Javanese if you are heading towards rural areas. Like other countries in the world, speaking at least some Indonesian phrases or attempting to learn is greatly appreciated by locals. 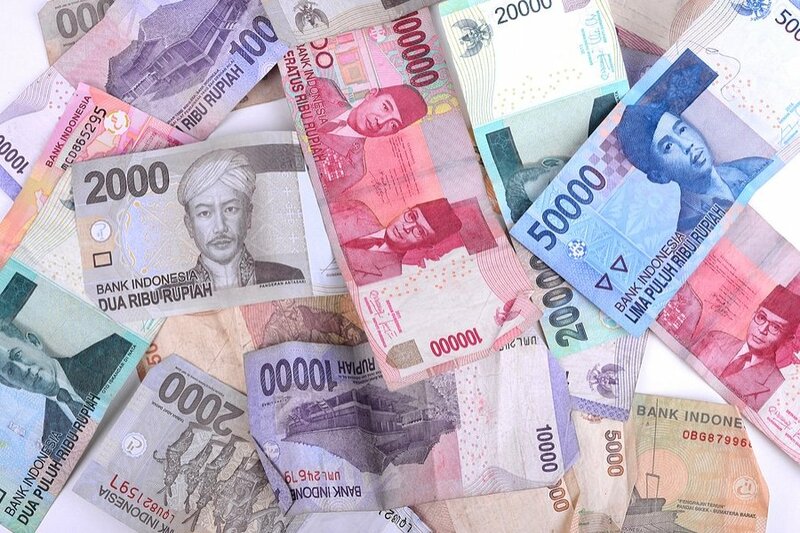 Currency Exchange – The Indonesian Rupiah (IDR) is the official currency of Indonesia. Exchanging money is easy and follows the same standard to elsewhere in Asia. You can exchange currency at the airport, hotels, malls, local banks, and money changers throughout Yogyakarta. ATMs are plentiful, all accepting international credit cards and debit cards, so it’s easy to withdraw your money in Rupiah. Credits cards are commonly accepted in most mid-range to high-end restaurants and hotels. 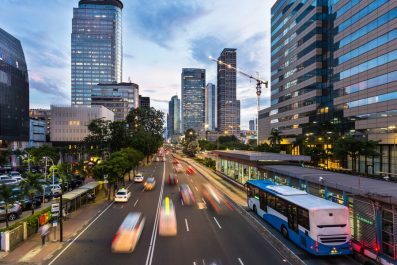 Etiquette – Despite being open to foreign influences, Indonesia remains a fairly conservative nation. Handshakes are common when meeting someone. Avoid touching someone’s head as the head is considered sacred in eastern culture. There’s no need for a foreigner to feel obligated to dress in traditional Indonesian clothing. Modesty is the key in Java. If there is some kind of ceremonies going on, it is imperative to follow simple temple rules. To get into the temple, temple costumes should be strictly put on, while for other days one should wear polite dress with temple sash circled around waist. It all means to show respectfulness to God and to local tradition which ensure a memorable experience. Safety and security – There is currently no nationwide security advisory in effect for Indonesia. Check your country’s travel advisory website to get the most up-to-date information for your personal safety abroad. Avoid all travel to Central Sulawesi, East and West Kalimanta, and Papua due to serious threat of terrorism and kidnapping. Every traveler should take safety precautions because there has been an increase in reported armed robberies and other opportunistic crimes targeting tourists. Driving on your own is not recommended because road travel can be very challenging and locals have little regard for traffic regulations. Getting to Yogyakarta – Adisucipto International Airport is a small domestic airport that serves the region of Yogyakarta. It is very well connected to Jakarta (25 USD each way) and Denpasar (39 USD each way), which are the main international airports for tourists. Where to stay – Due to its popularity among visitors worldwide, Yogyakarta has heaps of accommodation to suit every pocket, from budget hostels to luxury hotels. To help you decide on the best place to stay, it is recommended to do a bit of prior research so you won’t land in the wrong part of this busy city. Malioboro (and the Center of Yogyakarta), for example, is for visitors who want to stay in the center of the action. It is also a fantastic base for sightseeing. Jalan Prawirotaman and the South, on the other hand, is for art enthusiast and for people looking for a vibrant nightlife scene. Since you only have 3 days out of the 7 days to spend in Yogyakarta, it can be tough to whittle down the must-sees. It is best if you hire a private driver and a tour guide, which you can arrange prior to arrival (either through your hotel or a travel agency, or use TripAdvisor to find one with good reviews). This will be a fantastic introduction to the most famous attractions of Yogyakarta and you may take this opportunity to ask your guide any questions you may have about life in Indonesia. Do your homework and research the possibilities of hiring a driver prior your trip. You can start with the two most recommended taxi companies on Tripadvisor – TW Driver Jogja and Jogja Jaya Transport. 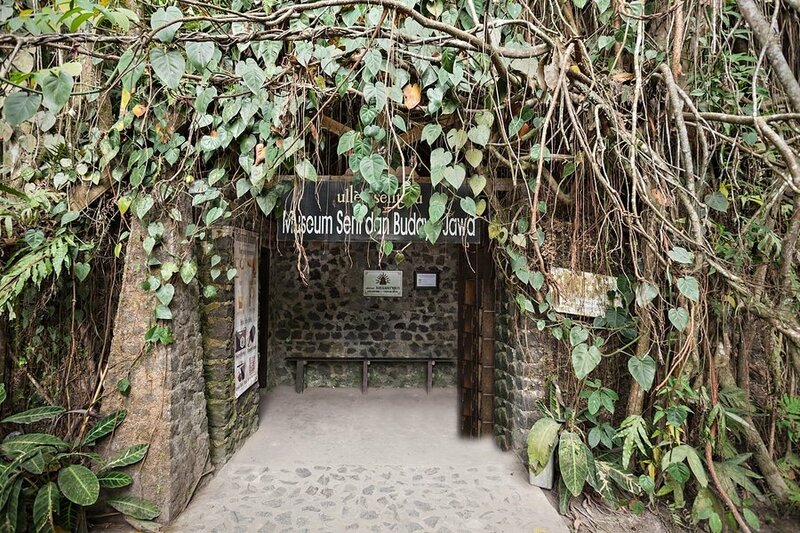 Start the tour at Ullen Sentalu Museum, a Javanese culture and art museum. It is currently ranked No.1 attraction on TripAdvisor and for good reason. 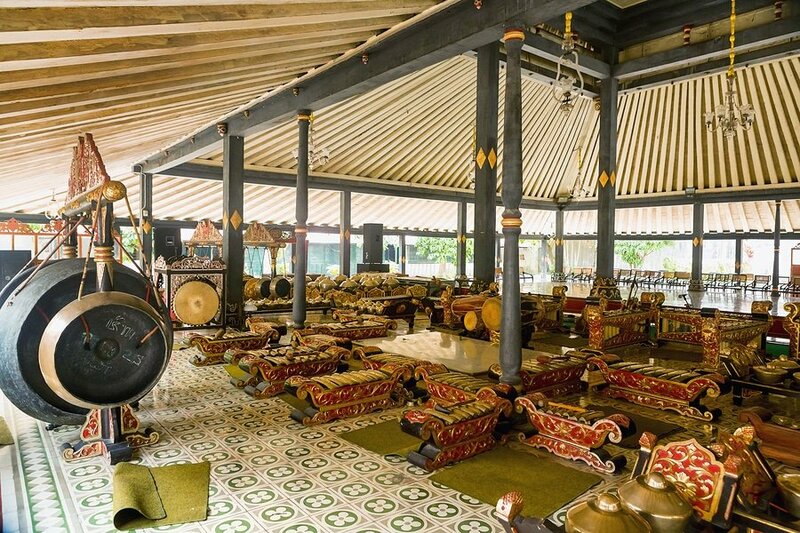 This large complex features a well maintained garden, beautifully preserved relics and artifacts from royal houses (Kraton in Javanese) and rich collection of Javanese oil paintings and sculptures. Just before lunch, head to the Sambisari Temple. 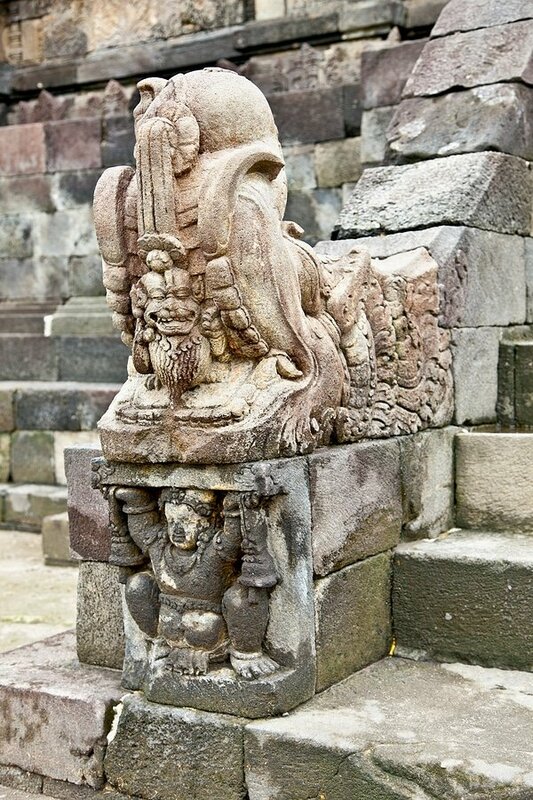 This 9th-century Hindu temple is close to Yogyakarta Airport (Adisucipto International Airport) and is famous for its Buddhist and Hindu elements. Then, sample the best Javanese dishes at one of Yogyakarta’s most popular local restaurants like Milas, Jejamuran an The Sawah. 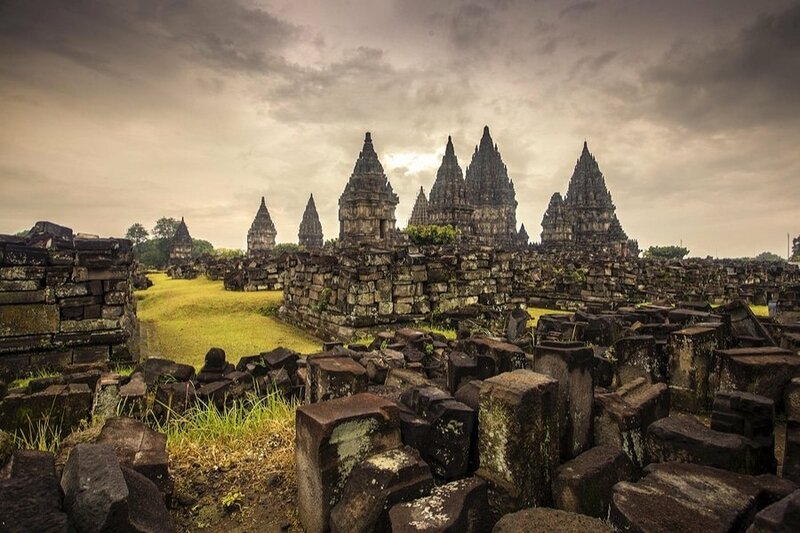 In the afternoon, your next destination is Prambanan Temple Compounds. It was recognized as a UNESCO World Heritage Site and has been well known as a tourist destination. Not only it is a photographer’s paradise, this is also the largest Hindu temple compound in Indonesia. It was built in the 10th century and it was dedicated to Shiva, one of the principal deities of Hinduism. It is recommended to visit Prambanan in the afternoon so that you can catch the sunset and watch the Ramayana Ballet. 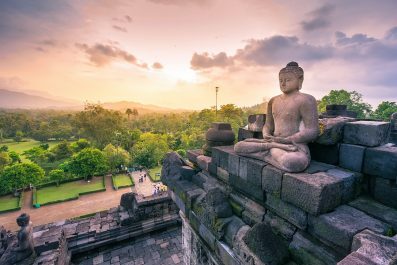 Waiting for the sun of the new day to appear on the horizon in Borobudur Temple Compounds is one of the most fascinating experiences you could get in Indonesia. This Buddhist temple located in Central Java is designated as a UNESCO World Heritage Site and is probably the most iconic temple in Indonesia. The compound is quite big consisting of three monuments namely Borobudur Temple, Mendut Temple, and Pawon Temple. Thus, it would take 3-4 hours to fully explore the whole place. After the Borobudur tour, some travel packages offer a cycling tour through the local villages near the compound. Start in Yogyakarta Kraton (Royal Palace), the official residence of the Javanese monarchy in Yogyakarta. Constructed in 18th century, this palace is now open to the public and has become a Javanese museum. If you happen to be in the Kraton on a Sunday, then you can watch the classical tale of Ramayana. Just southwest of the Kraton is Taman Sari Water Castle, a former royal garden and castle baths of the Yogyakarta Sultanate. For lunch, head to Balé Raos Royal Cuisine Restaurant and enjoy a traditional Javanese meal. Another option for this day is a short excursion out of Yogyakarta to visit Merapi Volcano and Jomblang Cave. Take a flight that will arrive early at Surabaya Juanda International Airport. Travel to your chosen accommodation in Surabaya where you will be staying for one night before your adventure in Mount Bromo. If you’re on a tight schedule, we recommend flying from Yogyakarta to Surabaya and then arranging a car rental to take you to Bromo. Garuda Indonesia, Lion Air and Sriwijaya Air serve the Yogyakarta – Surabaya route, and travel time is about 1 hour and 10 minutes and prices for one-way tickets start at 31 USD. Don’t rush to get away of Surabaya like most tourists do because the capital of Jawa Timur (East Java) boasts some wonderful attractions. Some of the attractions you can visit on this day are the Sampoerna Museum, Masjid Nasional Al Akbar, Suramadu National Bridge, and Muhammad Cheng Hoo Mosque. Get up early and take the bus to Bromo from Surabaya Bus Station. 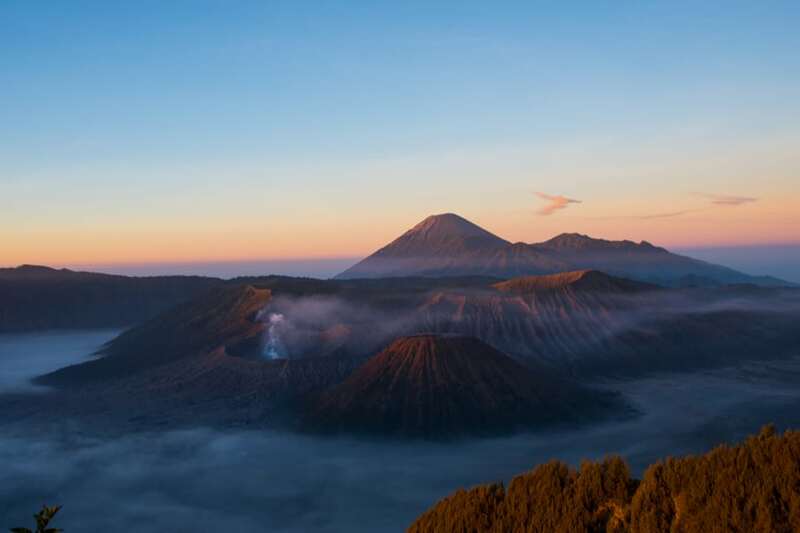 About 5-6 hours aways from Surabaya, traveling by bus to Bromo is probably the most relaxing way to reach Bromo Tengger Semeru National Park, where Mount Bromo is situated. 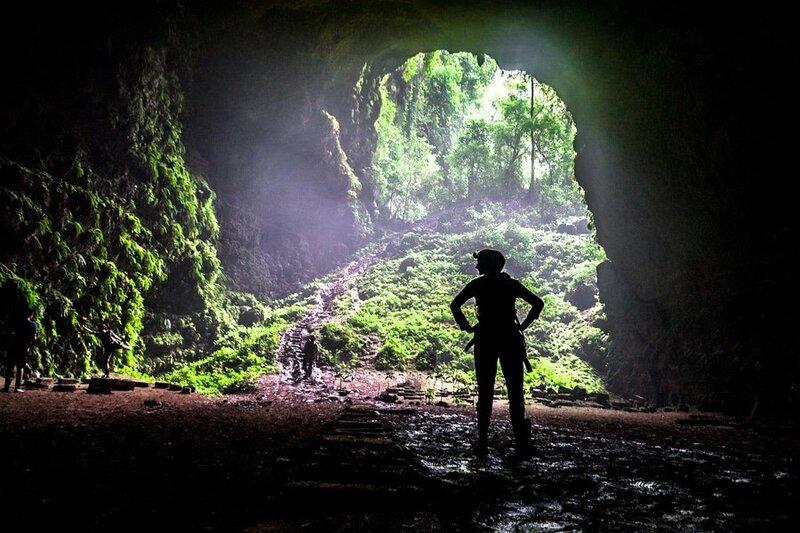 There are four gates to access the national park: Wonokitri, Probolinggo, Ngadas and Lumajang. 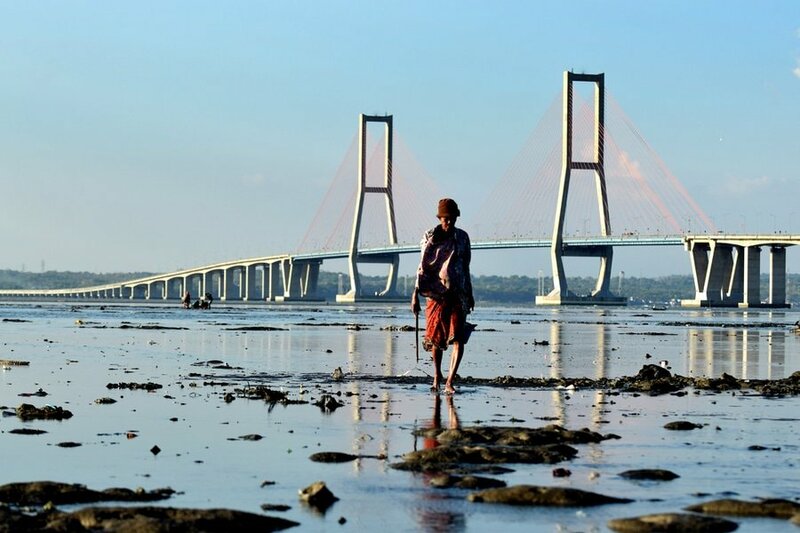 The Probolinggo route is the easiest and the most popular among budget travelers. If you are on a luxury vacation, consider hiring a driver from Surabaya, and take the Wonokitri route, which is the fastest route to Bromo. Make sure to find a hotel or hostel with good reviews and book well in advance. There are several accommodations in the heart of the protected natural preserve where you can practically see the mountain from your bedroom window. Accommodation options in this area costs higher than the usual Indonesian ones, but they provide easy access to Mount Bromo. 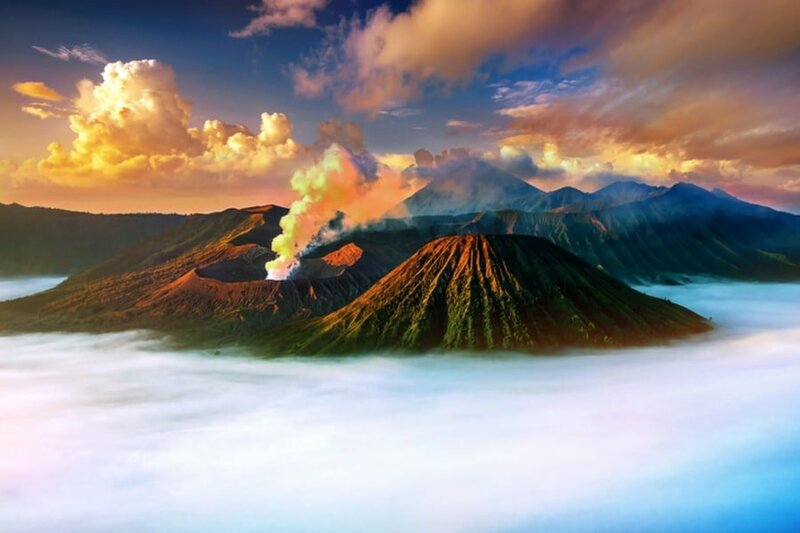 You may also opt to stay Probolinggo and just take a day tour to Mount Bromo. On day 6, after having a filling breakfast, set out at 3:00 AM for the impressive Mount Bromo. Assuming you choose to stay at Cemoro Lawang, the mountain village that’s right on the edge of the Bromo Tengger Semeru National Park, then you can start the trek between 3:00 to 3:45 AM. Enjoying the view of the crater inside the crater and the sunrise views are the main attractions in the national park. The opportunity for incredible photographs is endless during the trip, so frequent stops are recommended for visitors to enjoy the landscape. 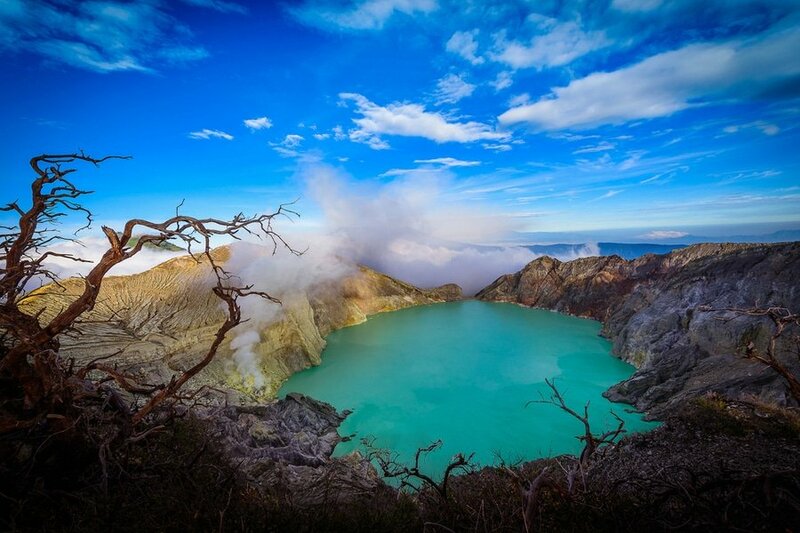 On day 7, begin early with a quick trip to Ijen Crater, the less crowded and touristy sister of Mount Bromo. You will wind your way through different stations depending on the types of activities you want to be involved in. You’ll walk along well maintained footpaths and get an up-close glimpse of the turquoise-colored crater lake from a number of perfectly perched view decks. Although Ijen is sleeping at the moment, it is declared an active volcano and is actively producing pungent odor of sulfur that is harmful to humans. Even though it has been declared as harmful, you will see many sulfur collectors that hike up here to mine the minerals at the crater every day. This is the end of our 7-day suggested itinerary. Remember, this is just a guide for planning and is in no way, shape or form the only way to travel the city. There are several alternative routes of travel within the country and it will depend on your intended length of stay. Enjoy Java! Have you been to Java or anywhere else in Indonesia? Do you have any tips or suggestions to share? If so, you can leave your comments below.